The Sechrist HBO TV system* has been developed as another value added feature for Sechrist hyperbaric customers to enhance the patient’s audio and viewing enjoyment, while undergoing hyperbaric treatment(s) in our Sechrist monoplace chambers. 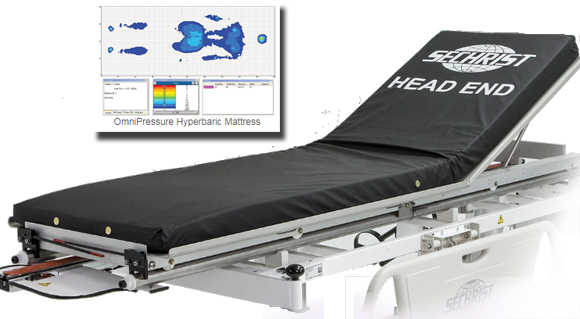 The TV system can move freely along the chamber tie rods and be positioned optimally, depending upon the patients head location inside the chamber. In addition, the TV has a viewing angle adjustment range of 60º. Depending upon the chamber model, the electric cables are positioned on the side opposite the control panel, thus eliminating cumbersome obstructions to the operator. Featuring an LCD fl at panel widescreen television, the Sechrist HBO TV system offers the latest in television technology. This TV system is easy to install and the cable/adapter accessories provide the necessary connections for cable, VHS and DVD use. For additional information on this new product, lease contact a Sechrist representative or contact our Customer Service Department.